Navitar Zoom 7000 18-108mm Macro Lens - In Stock! The Zoom 7000 offers a superior design for close-focusing macro applications requiring a working distance of 5 inches to infinity. It is compatible with imagers of 2/3 inch format and smaller. Its image clarity and parfocal zoom performance is unsurpassed by similar lenses in this category and price range. The Zoom 7000 is ideal for QA/QC, assembly applications or even biomedical imaging. 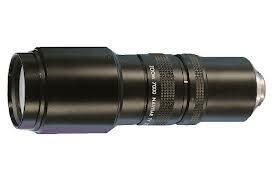 It offers a 6X magnification over a focal range of 18 mm to 108 mm. An interchangeable close-up lens is included for imaging at distances from 5 to 12 inches. When the close-up lens is removed, the working distance extends from 24 inches to infinity. Focus and aperture control are standard Zoom 7000 features. Field Angle (HxV) 2/3″ Wide 27×20 deg. Tele 4×3 deg. 1/2″ Wide 19×15 deg. Tele 3.3×3 deg. 1/3″ Wide 14×11 deg. Tele 2.5x 1.5 deg. 1/4″ Wide 10×7.5 deg. Tele 1.75×1.4 deg.